Being the Queen of Naboo isn't all about the poise and stature of simply looking queenly. It's not just all about drinking tea and eating crumpets. It's much more about dodging assassination attempts placed on your life, trying to negotiate peace with the Trade Federation, and blasting bad guys who threaten the safety of Naboo with a sleek looking pistol! Well, that and you have to look like a regal and distinguished leader throughout all the whole ordeal AND deal with Jedi who really just do their own thing and never listen to you. Yeah, we're looking at you, Qui-Gonn Jinn! In the midst of all of this, Queen Amidala pulls it off, with some insane poise and leadership, even bringing about a peace between her people and the Gungans (with a little help from Jar-Jar). Yup, she really did it all, and now you can take on the role of one of the youngest and most influential rulers of the galaxy far, far away when you go in this Queen Amidala Costume. The iconic red "Throne Room" dress features printed details, gold accents, and even those funky looking amber bulbs at the base. (If you can get into the mind of her royal highness could you please let us know what those things are? Sure they look cool but we just want to know just what they really are!) With included ceremonial headpieces, all you'll have to do is use a little makeup to get her movie appearance. 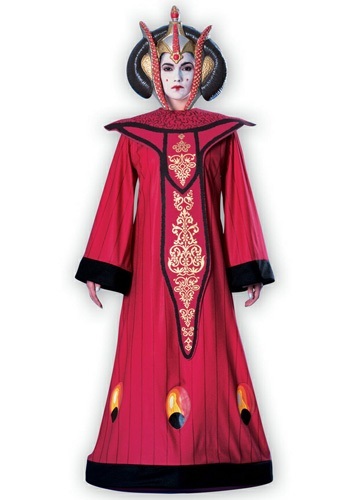 We're sure that everything's going to be fine and dandy when you go in this Star Wars costume and it won't turn into a whole debacle like in The Phantom Menace. And if it does? Well, may the force be with you!